There is always an occasion or event to attend and we need to decide the outfit to wear. The occasion could be a party, wedding, burial, graduation or casual outing. Picking out your outfit for an occasion depends on factors like the time, place, people involved, your wardrobe, mood and jewelry. All these put together would determine your final look. Picking one of the factors earlier mentioned -your jewelry. How do you get the best out of your jewelry? How do you choose the right necklace, earrings, bracelets or rings to complement the occasion and your wardrobe? For a day occasion like a wedding, you can go for western look. This is simple and less stressful in getting ready. For the jewelries, you can pick timeless pieces like pearls or any other gemstone beads in matching colours. There are different types of gemstones which you can wear to reflect your personality and complement your outfit. Here, the jewelries are made specifically for you as it is in the case of handmade jewelry. 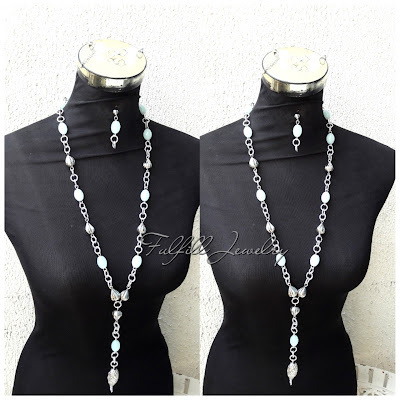 You can also go for gold, silver jewelries alone or mixed with beads to reflect your personality. If you opt for traditional look, then you have to match your scarves (gele) with either your shoes or bag or both with the outfit. You can never go wrong with corals, swarovski crystals, chinese crystals… These beaded jewelries help to bring out the outfit making it very colourful and attractive but at the same time complementary to the whole look. Go easy with the rings though two rings on each hand at most should be fine. However, for those who love to adorn all their fingers with rings should feel free to do so…that is your personality reflecting in your jewelry. For me, less is more. If you are wearing an outfit with sequins and sparkles, then minimize the jewelries you are wearing. I mean, wear less jewelry. You can pick a piece or two of jewelry to use for that outfit- say a long earrings, a bracelet or ring. Do not wear all these jewelries at the same time since the outfit is already ‘loud’. Picking a western or traditional outfit is fine as this depends on the occasion. A party or club would definitely go with the western look (like a dress, trousers and matching tops, shorts, jeans). You can wear a nice long skirt and matching top to a house party. Yes, you can still wear a bou bou( Nigerian traditional free-flowing gown). Remember comfort is key, as it would not be proper struggling with your gele and wrapper (traditional outfit from Nigeria). Neither would it be safe to wear so many jewelries as this would put you in danger or being robbed except you are in a very secured environment. Therefore, you must choose and act wisely. Whatever you decide, jewelries are meant to complement your outfit and reflect your personality. While you are deciding, remember to pick what reflects YOU-makes you comfortable, elegant and beautiful. Have fun and be you! This is a very helpful article! I have learnt some good tips from here!! Thank you so much! Your articles are helpful! Keep up the good work! Thanks Ashan-wa for your kind words. I'm glad they are helpful.